For the Mean streets Brevet, I did two things to prepare. The first one, having remembered how many route instructions were on this brevet from 2 years ago, I spent some time tracing the route on the Toronto Bicycling Map a few times. I figured that if anyone wanted one it would help, if not at least I would be familiar with the route in map form. At times during the ride I was the (semi)effective guide. Secondly, in my preparation I went out to a small gathering until midnight, had some tequila, and then came home and spent a couple of hours messing around with a computer trying to print off the office route sheet (just in case). By 6:30am I was only partially dry mouthed, and partially tired, otherwise I was feeling pretty good. The breakfast of champions was had (a can of Dr Pepper), and then I rode that great distance to the start of the ride. A lot can happen in a 2.5km ride, fortunately for me, nothing happened and I arrived at the start with lots of time to spare. 14 People were expected, 11 showed up, many I have ridden with before, some new faces to me, and two first timers randonneurs (Ben and Pavel). We got off right on schedule and headed down Avenue Rd. The first issue with the route was down on the Martin Goodman path, a fence blocked our way and we cycle-crossed around it, no problem! Further along, the bike path up Etobicoke creek has seen better days. At the top of the steep him leaving the valley, we were a group of 7, two Pauls, Pavel, Ben, Tristan, Karen and myself. Navigating was not so bad until we entered the next set of river valleys, we ended up on the surface at finch, when we wanted to under finch, so we went back down and found the real route, and my memory seems to think the group did the same thing 2 years ago. 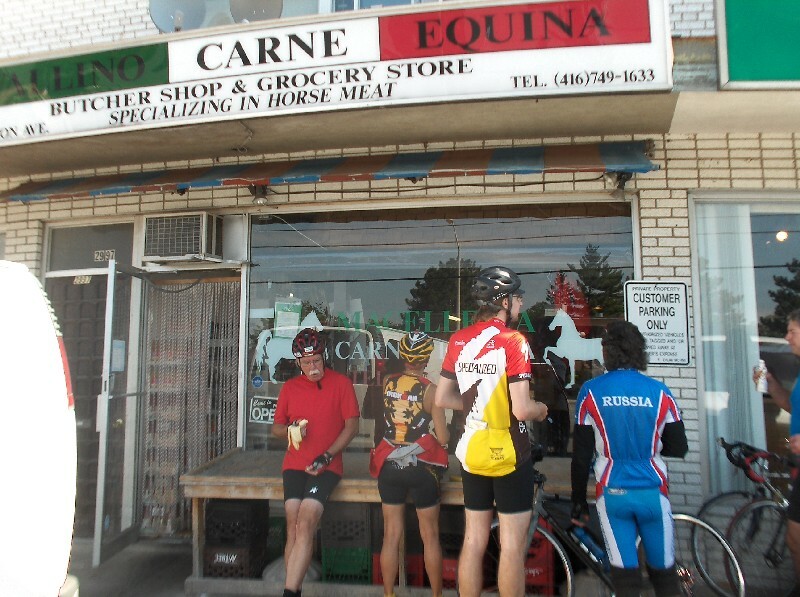 Most of us skipped the official first control in favour of the Horse Meat Cafe, and the variety store. If you are hankering for some horse meat, the establishment seemed to run by real friendly people, none of us tried the horse, but several had some bananas and other treats. Above: Paul, Karen, Ben, Pavel, and Tristan enjoy the yummy horse meat. Back on the road, and into another park system, where we got lost again, Tristan knew the way, we got out alive. As the course passed Bayveiw we stopped for lunch, at Coffee Time/Harvey’s. While I was able to pass up the horsemeat earlier, the double bacon cheese burger had quite the draw. The others had more sensible food, but remember my day started with a Dr Pepper for breakfast. The navigation got pretty easy for the next bit, follow this road till it ends, follow another road till it ends, wow are we still in Toronto? Steeles is not fun to bike on. How many times are we going to cross Little Rouge Creek? Weeeee! Damnit, that looks steep! And finally Ice Cream! Cheap Ice Cream too! Above: Ben, Karen, Pavel, Paul D and the other Paul enjoy something other than horse meat. We left Reid's Dairy as the same group of seven, heading back towards Toronto. Ben showed off his excellent mountain biking skills on his not so mountain bike. Who needs to walk down stairs when there is a perfectly good dirt trail going down the hill? The rest of us... that’s who! Good show Ben! Further on, back into another valley we lost Paul D at some point, a search party was sent out, but they returned exhausted and without Paul. We think the valley monsters got him, the same ones that ripped up the bike path. There were a few sections missing, we carried our bikes along a sloping section of hill. Found our way out of the valley, and back on the roads... wait... Old Kingston Rd, didn’t we just do this road? 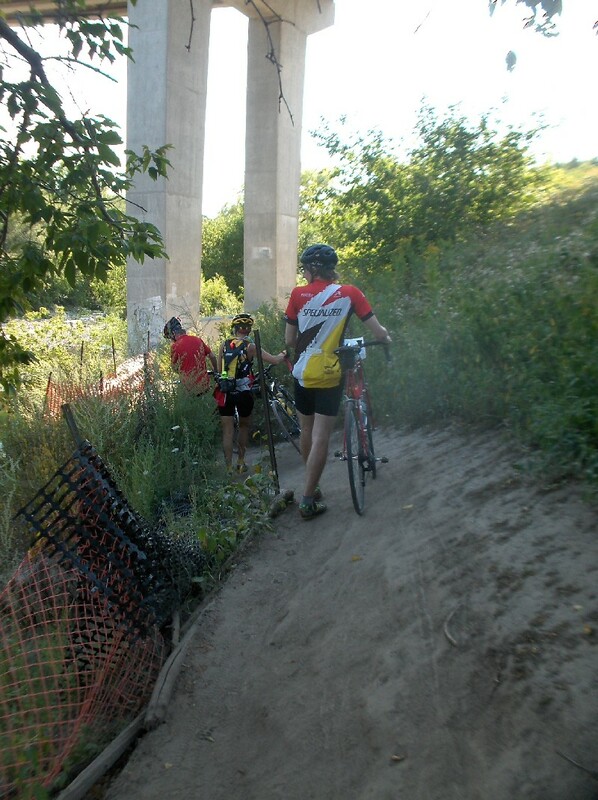 Above: Paul R, Karen, and Ben traverse the missing bike path. It wasn't long before we were heading down into Bluffers Park, I nearly lost control when I was blinded by Mike M's bright shirt, but momentum kept me upright. Tanya and Mike brought us cookies for the secret control, my first in the 10 randonneuring rides that I’ve started. The climb out of Bluffers was steeper than I remember, but 2 years ago when I last did it, I was better shape having returned from the big tour. We all made it up, and headed to the final control which of course does not exist anymore, so we choose a variety store on Gerrard. The next couple of Km's on Gerrard were filled with some fun obstacles provided by the stupid drivers of Toronto. Probably our only encounters on the ride of the like. We headed up Logan Ave, starting to turn our lights on for the approaching darkness. It wasn't long before we were back on Lawrence for the 3rd and 4th time and back at the finish at 8:30. Tristan claims he crashed on one of the last corners, I still am not sure whether not to believe him. I hung out with Ben and Pavel for a bit, I am thinking they will both be back for more rides. Both of them finished strong on a difficult 200k ride. We let them know it’s not a typical ride except for the nice points (teamwork, pace, controls and food). After a bit, I headed off for that long ride home. Despite the toughness of the ride, with the stopping, starting, traffic, and navigational issues, I really enjoy this ride. In years past most of my riding has been in the city, in my younger days I used to play in traffic for kicks. The route does need some updating/tweaking to get the controls in order, maybe a few new sections for spice. I think I might put a bit of thought into this over the next few weeks. Thank You to everyone for good company during the ride, and bonus points to Tanya for organizing it. I'll see ya all next year for the end of summer tradition.